These bite-sized pieces of holiday goodness will melt in your mouth. Thick, rich, non-dairy coconut cream is used in place of cream, making these truffles just as rich and delicious as their dairy-laden counterparts. I like them chilled, right out of the fridge, but they're just as delicious at room temperature. Once chocolate is velvety smooth, stir in the coconut cream, Earth Balance and maple syrup until a smooth mixture is achieved. Remove from heat and stir in the extracts, orange zest and salt. Allow to cool at room temperature and then transfer to freezer to firm up the truffle mix. 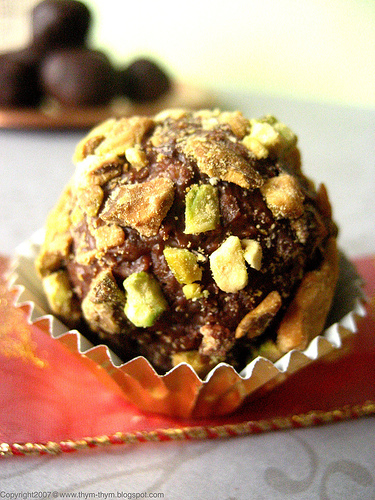 Using a melon baler, scoop truffle mix as quickly as possible using the tips of your fingers, to prevent the chocolate from melting. 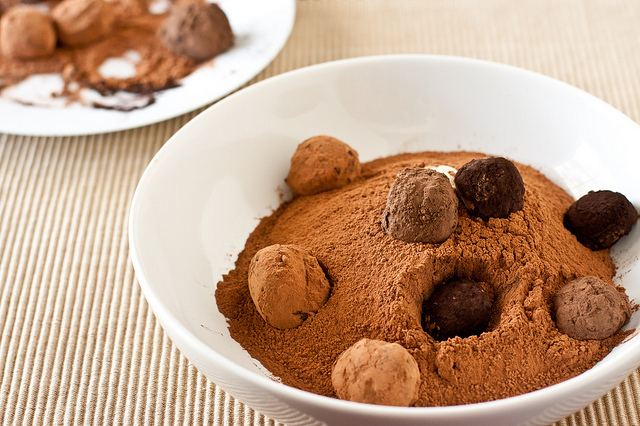 Roll each ball in either powdered sugar or cocoa powder. Or both! Place balls on a wax paper lined baking sheet or flat plate. Pictured above is a recycled rosemary package. These look SO good, Lisa!